In the course of my genealogy research I pour over articles from old New Haven newspapers. Most of the stories are mundane. I usually find police reports that mention many of my relatives being arrested for public drunkenness or selling liquor on Sunday. Once in awhile I stumble on a story with a little more meat to it. Such a story starts with my relative, John Brereton, a New Haven fireman born in 1857 in Ireland. In 1885 he married one Catherine Kelly. The couple had three children. By 1890 the couple had separated and Catherine sued John for divorce. The divorce and custody of children was granted on basis of habitual intemperance and intolerable Cruelty. Just to give some credence to Catherine’s claims, I found another article In March 1890, reporting how John and another man were arrested for breach of peace due to an attack on a man that came to John’s house to supposedly buy liquor, although the house is not licensed to sell it. A very brutal, bloody fight ensued. John and his friend tried to say that they were the victims and only acted in self defence, but the judge did not believe their story. 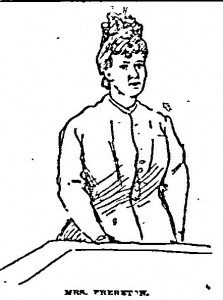 Later in 1891 I found a story reporting that Catherine Brereton, the widow of John Brereton, and a “Jane Brophy” wife of James Brophy were involved in an altercation. It seems that James was married with children, but that his wife and he would often separate.. and then get back together. 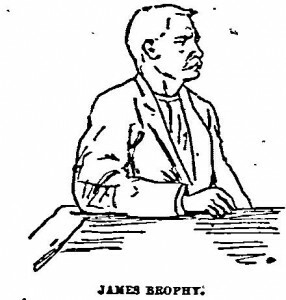 There is not reason given for the fight, but based on the rest of this story, we can safely assume that the women were fighting over James Brophy.